The Wilcox Book, a translation into English of EG Wilcox's sermons to help the Brazilian people evangelize. See the third edition in "caligrafia mais atualizada"
da terceira edição "caligrafia mais atualizada"
Dedication for What in the World Is God Doing? Four score and eleven years ago I was born in Waco, Texas, the second child of Lawrence Alexander and Ruby Condell Dickson. Now it is time for me to put in writing a synopsis of my basic convictions. I have declared these truths through almost sixty-nine years since my ordination to the Baptist ministry on May 8,1937. 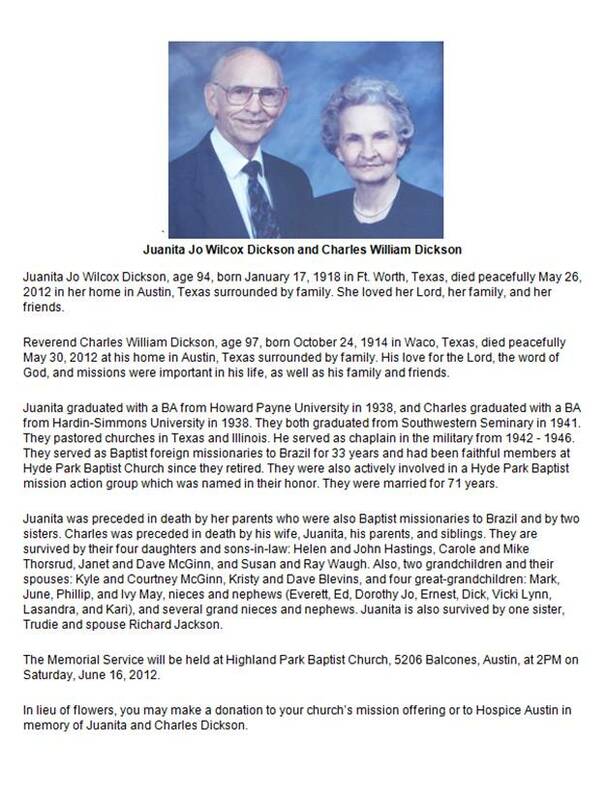 I have had the privilege of sharing them with people in my pastorates in Texas and Illinois, in the chaplaincy during World War II, (1942-1946), and as a missionary of the Southern Baptist Convention in Brazil (1947 - 1980). I dedicate this book to my faithful companion in the ministry, Juanita J. Wilcox, and to our four daughters: Helen, Carole, Janet, and Susan. The ideas expressed here I have preached in English and in Portuguese, and, hopefully, in my life as well. I have gleaned these beliefs from the Bible and other books as well as from people whose opinions I respect. I make no claim to originality nor to infallibility. These are simple truths that I believe are basically correct and worthy of passing on to future generations. I gratefully acknowledge the help that I have received in the composition of this book. Among the many who have made significant contributions to it are my four son-in-laws: John, Ray, David, and Mike. They have been generous to me as they made their computer expertise available to me. My thanks goes to each of them as well as to many others who have enriched my life through the years.